After I created the video tutorial Install WordPress on a Localhost I started receiving a ton of emails from people using Macs. 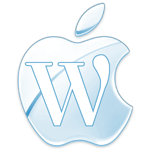 In this article I’ll show you exactly how to Install WordPress on Mac. You need to follow the instructions I covered in this tutorial Install WordPress. It sounds like a lot, but I’ve included everything you need below so you can just cut and paste. You need to open it in a program like TextEdit or my favorite free text editor called TextWrangler. If you downloaded Text Wrangler you can open the file by clicking File – Open File By Name. Then paste in the directory above. AllowOverride needs to be set to All like I have it set above. Save the file. Now open the Terminal program, find the above file and enter the following: chmod 755 .htaccess This will give WordPress permission to make the changes it needs to make. Save it and just one step left! Click save changes and your done. Everything should function pretty much in exactly the same way as if you were on a hosting server. If you have any questions or comments leave them below. If you would like me to create a tutorial for you leave those requests below as well. Thanks for the tutorial! My httpd.conf is located in /private/etc/apache2/, though, while /opt/local/ doesn’t even exist. What can I do to get permalinks to work?